Welcome to our Parent Resource Center! Here you will find answers to some of the most commonly asked questions we receive, as well as additional information we hope you will find useful. Have a question that isn’t answered below? Please give us a call and we’d be happy to discuss it – no question is unimportant when it comes to the care of your child! What is the schedule for well child visits? Babies/children are seen at 2 weeks, 1 month, 2 months, 4 months, 6 months, 9 months, 1 year, 15 months, 18 months, 2 years, and then yearly. During these visits, your child will receive important screening and assessment of his/her growth and development, as well as any recommended vaccinations. The physician will discuss your child’s feeding habits, sleep habits, schooling, hearing, vision, vaccinations, and any other concerns or questions you have. What are the recommended vaccinations and their schedule? Kagan Pediatrics follows the vaccination schedule set by the Center for Disease Control (CDC), which is also recommended by the American Academy of Pediatrics. You may see a full breakdown of the vaccinations and schedule at: http://www.cdc.gov/vaccines/schedules/downloads/child/0-18yrs-child-combined-schedule.pdf. When is flu season and when does my child need to receive his/her influenza (flu) shot? Flu season is typically September through March each year, with a peak in December through February. Each year, the Center for Disease Control designs a vaccine to protect against the viruses most likely to spread and cause illness during the upcoming flu season. Flu viruses are constantly changing, so the vaccine is updated each year based on which strains are making people sick, how they are spreading, and how well the previous season’s vaccine performed. Kagan Pediatrics typically has flu shots available from the beginning of September through the end of the flu season. However, we recommend you call to ensure availability. What is a parental prenatal consultation? A parental prenatal consultation is an appointment for expecting parents to come meet and visit with the pediatrician. It also allows expecting parents the opportunity to see the office, meet the staff, and hear about Kagan Pediatrics’ office policies and practices, as well as ask any questions you may have. Kagan Pediatrics encourages expecting parents to schedule a prenatal consultation for many reasons, one of which is to see a familiar face in the hospital after you deliver your child! Kagan Pediatrics offers courtesy parental prenatal consultations Monday through Friday, and these visits are most often scheduled at 1:45pm. Will I see you in the hospital after my baby is born? Yes! If you are delivering at one of the hospitals where our doctors have privileges, your child’s pediatrician will come and see you and your baby within the first 24 hours and each day you are in the hospital. Please refer to the Services page (link) for a full list of the hospitals at which our doctors have privileges. Make sure you inform your labor and delivery nurse that one of the Drs. Kagan is your baby’s pediatrician so they can contact our office to let us know you have delivered! If you are delivering at a hospital at which our doctors do not have privileges, an in-house physician from that hospital will see your baby until you come to our office for your baby’s first well child checkup. The average normal body temperature is 98.6 degrees Fahrenheit. A fever is any body temperature measured above 100.4 degrees Fahrenheit. For babies under the age of 8 weeks, temperature should be measured rectally. For ages over 8 weeks, rectal, under the arm, ear, and temporal are all acceptable methods. How can I get a form for my child signed by the physician? Please try to bring the form to the office at the time of your child’s appointment. If the form is not available at that time, you may either drop it off at the front desk or fax it to us at (713) 436-9707. Our goal is to complete and return the form to you within one business day. What insurances does Kagan Pediatrics accept? Kagan Pediatrics accepts all commercial PPO plans and Texas Children’s Health Plan Medicaid. Please call our office to confirm we accept your child’s specific insurance and plan prior to coming in for your child’s visit. Do I have a choice of which physician my child will see? Yes! 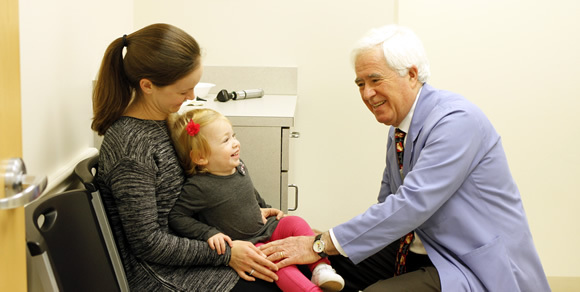 Dr. Ryan and Dr. Arnold Kagan work closely together, and all of your child’s medical history and information is accessible to both doctors. However, you do have the choice of which doctor your child sees. When you call to schedule your child’s appointment, the nurse will ask if you have a preference, and you are welcome to make a specific request or ask for the first available. How do I know when to bring my child in for a sick visit? Any parental concern is valid! If you are unsure, we encourage you to call and ask. How do I access the Kagan Pediatrics health portal and what is available there? The Kagan Pediatric health portal provides access to view upcoming appointments, prior visit summaries, labs, vaccination records, growth charts, and bill histories. You can also sign up for email reminders for upcoming appointments. Access our health portal here.